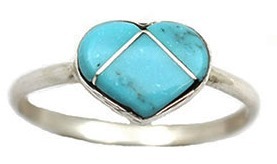 Sterling silver ring has a inlaid turquoise heart. Heart measures approximately 3/8″ wide by 5/16″ long. It is Zuni hand made by Linda Chavez. Size 7.